"If you can dream it, you can make it happen"
In this last years we have been increasingly aware of the amount of polluting activities that we can generate in our day to day. 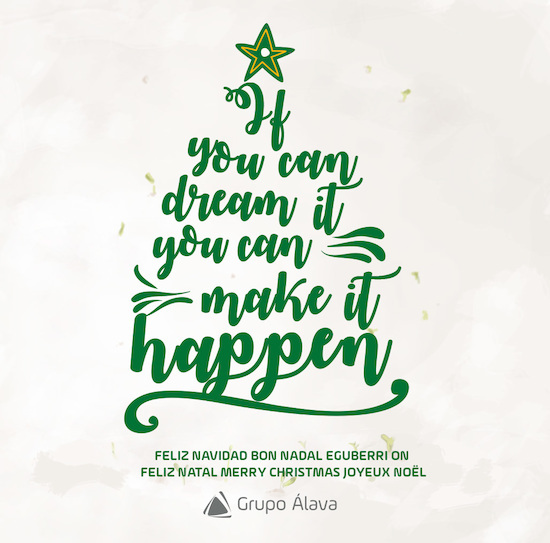 For this reason, from Grupo Álava we want to start 2019 doing our bit for the planet with a common purpose: "Let's take care of Our Future"
Do you join our purpose? When you receive our Christmas card ... you will see that it is special! Let's start this magic season with small actions. Together, we make a difference. This year, the budget dedicated to the Christmas Campaign will be channelled to a solidarity action in which all the employees of the Group will participate. For one day, we will put all our efforts and energy in tasks of reforestation, plastic cleaning and construction of water pools for amphibians. Because if you can dream it, you can make it come true.